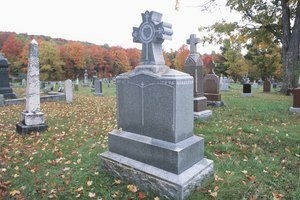 What Should I Write on a Cemetery Marker for a Mother? Your little one might compare your love to the love Mary had for Jesus. “Look, Mommy, I made this for you,” your little one says as she beams with pride. You might not know what the gift is, but you know it represents her love on this Sunday dedicated to mothers. If her Sunday school class is focusing on mothers, this is a great opportunity to talk about mothers in the Bible, as well as about God's love for all his children. Stories about mothers and their children are frequently told in the Bible. Have your preschooler match mothers such as Hannah, Sarah, Mary and Eve with their sons Samuel, Isaac, Jesus and Cain and Abel. Read short stories about these boys and their mothers using flannelgraph pictures to make this game easier. 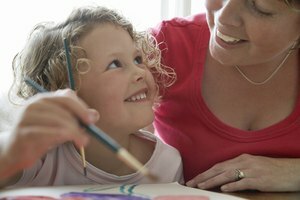 To talk about the love between you and your child, use pictures of things you typically do, such as cooking, laundry, caring for children and reading to a child, and have your toddler tell you about each activity. Talk to him about how these things show your love for him because serving other people, like Jesus did, is one way to love people. Dress your child in a long pullover shirt with a rope belt and a head scarf to transform her into a biblical woman. Give her a doll and have her dramatize the story of a famous Bible mother, such as Eve with Cain and Abel, Naomi and Ruth, Rachel and her sons Jacob and Esau or Mary and Jesus. Alternatively, she could use puppets to tell her story. If your little one has difficulty with Bible stories, she might portray you instead and demonstrate how carefully you take care of her or reenact stories she remembers about mothers who love their children. Start a story about Jesus’ mother, Mary, and have your preschooler tell you different things Mary did, such as go on a long journey and give birth in a stable or care for him as a boy. The story doesn’t have to be fully biblical, and might contain elements your child sees you perform as a mother. Read a story about a Bible mom to your toddler and have your toddler supply the name of the mom and the child at appropriate points in the story. Your toddler could also tell you part of the story based on pictures in his Bible storybook or a picture book. Your little one enjoys making and giving you gifts on Mother’s Day. Give her paper she can decorate and accordion fold, then glue it to a wooden clothespin to make a butterfly note holder that reminds you to be transformed with God’s love. She can slide heart-shaped pony beads on a pipe cleaner to make you a pretty bracelet or slide the beads on a 20-inch piece of ribbon to make a necklace. A paper-wrapped metal can becomes a pencil holder for your desk after she decorates it with Bible stickers. A paper box covered with acrylic gems can hold your jewelry or small mementos of her childhood faith walk. Rateliff, Kathryn. "Games and Activities for Mother's Day at Church." Synonym, https://classroom.synonym.com/games-activities-mothers-day-church-43599.html. 26 September 2017.